FOR three years the Victorian Bushfires Royal Commission’s independent monitor Neil Comrie has strongly advised the Victorian Government to abandon one of the commission’s recommendations: the call to burn 390,000ha of public land annually for fuel reduction. Yet Environment Minister Ryan Smith is sticking to that target and, even more puzzling, DEPI plans to increase that annual target to an extraordinary 450,000ha. Former police chief commissioner Comrie understands the importance of fuel reduction, but he sees the target as unachievable, and that it compromises a strategic burn program. He says it “will not necessarily reduce the bushfire risk to life and property, and may have adverse environmental outcomes”. That’s an expensive lose-lose situation. Minister Smith says he is listening to the latest science, but is he? Five leading fire behaviour scientists in Australia, Canada and the US have demonstrated that managing the ignition point of a fire through increased capacity for rapid attack, and by closing public access to remote areas during high fire danger days, was more effective in reducing the extent of fire than fuel management. And other published papers, from leading Australian fire scientists and ecologists, convincingly show that fuel reduction burns are most effective when performed close to the assets they are meant to protect. This is the sort of strategic effort — small, difficult and expensive local burns — that Neil Comrie says is less likely to happen when managers are struggling to sign off on a large area target. Many studies show that we now have very little long-unburnt bush left in Victoria, even in remote areas such as the Mallee, and that the impacts on native wildlife are serious and growing. One of the best ways to survive a severe bushfire is to have your own well-designed bunker at your home. That crucial fact never made it to the commission’s final recommendations. We need to develop a more comprehensive strategy for bushfire management and direct more attention to the whole range of available tools, including building a serious rapid attack capability, encouraging well-designed bunkers in existing homes, and developing a far more strategic burn program. Lives would be saved, and our great natural heritage would benefit. A clear majority of Victorian's want our native forests protected. However, the Napthine government still allows Vicforests to continue logging them, even though they operate at a loss. The export woodchip industry in NSW has collapsed and no longer buys wood from VicForests - which now has a very low value product with no buyers. Vicforests don't make a profit and should be shut down. We need political leadership and a commitment to modernise the Victorian paper industry by shifting out of native forests into existing plantations. Our forests are far more valuable for the water they produce, the carbon they store and for tourism. The proposed Great Forest National Park would see our Central Highlands forests protected, along with Leadbeaters Possum and several other threatened species, for future generations to appreciate. EARLIER this month VicForests, the state government-owned entity that manages logging in the state’s native forests, celebrated its 10th birthday with a party. On the face of it the foresters had a lot to celebrate. In its first eight years, despite taking in hundreds of millions in revenue, VicForests made a profit of only $12.3 million and it hasn’t paid a dividend to its owners — the taxpayers — since 2007. Lately, however, the business seems to have turned the corner. In the financial year 2012-13 it made a profit of $802,000 on $106.3 million in revenue. Not great, but a profit is a profit. And according to government sources, when the next annual report is released, we can expect to see a doubling of VicForests profits to about $2 million. But according to informed government sources, that is the last good news the taxpayers can expect from VicForests for a long time. This year, they say, it will be lucky to break even. And after that it is likely to be all downhill. The reason is that in May, South East Fibre Exports, which operates out of Eden in southern NSW, announced it would not renew its contract to take product from VicForests when it expires at the end of this year. SEFE currently takes about 200,000 cubic metres of timber from East Gippsland, which it exports as woodchips. Even with the SEFE contract, the VicForests operation in East Gippsland is said to be losing between $5 million and $6 million a year. When that revenue goes, the losses will skyrocket. But VicForests is refusing to concede it’s curtains for native forest logging in the east of the state. “The challenge in front of us now is to build a different future for the timber industry in East Gippsland, which continues to provide jobs and economic benefits to the region but may not include export woodchips,” VicForests CEO Robert Green said in May. Of course, in addition to the contractors who extract and haul the stuff, there will be people employed at sawmills — but it’s not exactly Holden, is it? Turning away from East Gippsland to the profitable bit of VicForests, the Central Highlands, the picture is a little rosier. No one is denying that logging in the Central Highlands is profitable. And, unlike East Gippsland, there are a lot of jobs dependent on it — namely at the Maryvale paper mill, which employees 900 people. How wedded Australian Paper, which operates Maryvale, is to VicForests’ product is an open question, however. In the past it has been reported the company would like to transition out of native forest timber. But there isn’t enough plantation wood at the moment to replace native wood. Actually, there probably is enough timber, but it’s in the wrong place — the Green triangle in the state’s far west. The problem is that getting it to the Maryvale mill is too expensive. Were the Government to offer a subsidy to transport plantation product, the company would probably jump at the chance to use it. How likely are we to see a change in government policy on native forestry before the next election? While there’s no doubt that Agriculture Minister Peter Walsh is a firm friend of VicForests, his views are not shared by a number of Liberals in the Government. The Liberals’ dislike of the organisation is partly environmental and partly economic — that is to say a suspicion of loss-making government enterprises. They can also see that a commitment to ending native forest logging would be handy in Melbourne going into November’s state election. That will be a space to watch in the next few months. In its heyday, the town of Cann River in the far east of Victoria was home to seven sawmills. But now just one remains . Bob Humphreys, 70, has run it for 43 years. As a boy he spent school holidays working at the mill. In all that time no changes have been as dramatic as those which have buffeted the industry in the past five years. "Our critical mass has shrunk to such an extent that sooner or later it will no longer be viable. And we're rapidly approaching that point, I reckon," Humphreys says. Forestry is one of the most disrupted industries in the country. On top of the challenges facing all heavy industry - the high dollar, international competition, falling commodity prices and relatively high cost base - the $7.5 billion timber industry faces specific difficulties at the heart of its business model. A perpetual and heated environmental contest hangs over native logging, and plantation growers are still dealing with legacies from shambolic tax breaks and collapses. The markets for their products, meanwhile, are in a state of constant change. The impact is broad, from small mills to the large state government-owned timber companies in NSW, Tasmania and Victoria. Tasmanian forestry giant Gunns is the most celebrated victim, although, in truth, most of the industry is under stress, or if you are being polite, "in transition". And there is likely more pain to come. The once-dominant native-forest chip export industry has been the hardest hit. Chips, not sawn timber, has sustained the industry for many decades. "I can’t argue that there is no decline in the native forest industry," says Peter Mitchell, an experienced timber man and general manager of South East Fibre Exports, a mill and woodchip exporter on the NSW south coast. "It is not happening because of green pressure. Not because of somebody sitting up a tree. It is happening because of the market." International competition from plantations in Vietnam, Thailand and South America produce cheaper chips with higher yields. They are crowding Australia out of its traditional and once lucrative markets in Japan. On the demand side Japanese buyers are less hungry as paper demand has flatlined and they are also confronted with a high Australian dollar. Some Japanese purchasers, mostly paper companies, are also reluctant to take woodchips from Australian native forests because of their contested environmental nature. That has driven the volume of native hardwood - such as eucalypts - down from 10 million cubic metres to 3.8 million cubic metres. The industry has been cut by more than half in a decade. The development of domestic hardwood plantations - such as blue gums - has added to competition for native chips. Companies such as TimberCorp and Great Southern gorged on juicy government tax breaks and planted swathes of forests across southern and western Australia. When they fell over the estates were snapped up at cut price rates and the timber is now being flogged off, meaning production has soared 350 per cent to 5.5 million cubic metres in a decade. The vast bulk of Australian export woodchips is now plantation-grown; they have replaced native sources in just a handful of years. Away from chips, the market for higher-quality native sawlogs, which are used in furniture and housing, is also sliding as international competition, alternative products and a quiet global housing market have nibbled on the demand side. And continued reductions in the amount of wood that can be economically or practically cut out of native forests in a sustainable way have also reduced the supply. The impact of these reductions can be seen in the NSW government's recent deal to buy out a chunk of a sawlog supply contract with building giant Boral after modelling showed that, next decade, forests in the state's north would be less productive than expected. In East Gippsland, Bob Humphreys once processed 65,000 cubic metres of native sawlogs a year across four mills in three towns; these mills employed 77 people. Now the remaining mill handles 11,500 cubic metres for sub-floor structures. He has kept the mill in the black through downsizing and a determination to maintain jobs in Cann River, where he employs 17 people. He says Cann River has become a ‘‘welfare town’’. When a round tree is milled into square planks there is a lot of waste. As is the case with many mills, Humphreys sells the waste for wood chips. He sells about 5000 tonnes a year to South East Fibre Exports, but in May SEFE announced an end to buying pulp logs or mill waste from East Gippsland from January. "I am yet to find a market for my residues come the end of the year when SEFE stops taking them. And that may be a precursor to my final demise, I'm not quite sure yet,'' he says. His experience goes to the heart of the native industry’s economic underpinning. The harvesters who cut down the trees are like millers in that they sell pulp logs - smaller or lower quality logs that cannot be used in saw mills - for chips and are now also facing weakening demand. "Any forest owner needs a residue market to make things viable," Peter Mitchell says. "It is like selling the cow and only selling the T-bones; it doesn’t make sense, you have to sell the sausages as well." VicForests, which is in charge of harvesting native forests, is working to find alternative buyers for its pulp logs from East Gippsland. The state-owned company sold 200,000 tonnes of pulp log to SEFE in the 2012-13 financial year. Nathan Trushell, director of strategy at VicForests, says it may not need to replace the entire volume of lost sales. He concedes there will be likely be a hit - though not as large as people suggest - but he is giving little away about what VicForests might do. He says there are a range of measures are on the table, from different harvesting techniques to selling logs as firewood. Trushell says it is a chance to develop a more resilient industry that is domestically focused, and would likely be smaller. Notwithstanding VicForests' struggles to break even, Victoria’s native sector has actually held up better than that of other states. Victoria has become the largest harvester of native hardwood forests. But even Victoria has seen production fall by about a third to 1.3 million cubic metres over the last decade. Crucially, the state's most lucrative logging region – the mountain ash forests region of the Central Highlands – has a stable pulp log customer in Australia Paper, which is owned by Japanese paper giant Nippon. Australian Paper’s Maryvale mill in the Latrobe Valley uses VicForests residue along with plantation timber to produce Reflex printing paper. VicForests and Nippon have faced staunch opposition from environmentalists and scientists campaigning to protect endangered species, such as the Leadbeater’s possum, and the mountain ash forests that were ravaged in the 2009 Black Saturday bushfires. Ten years ago NSW produced roughly the same amount of native timber as Victoria; now it has dropped well below 1 million cubic metres. The Forestry Corporation of NSW – also state-owned – has posted operating losses from its native timber operations of about $15 million a year since 2010-11. These losses were easily offset by the returns from their plantation assets – largely softwood species such as pine trees that are used as sawlogs, mostly for housing. The future of South East Fibre Exports is critical for forestry in the state's south. Long a profitable business, SEFE has struggled to break even in the past three years. SEFE’s owner is also Nippon as well as Japanese trading company Itochu. Nippon for a long time also bought all SEFE's exported woodchips. That came to an end when Nippon got access to higher quality chips from other sources. Nippon told SEFE it no longer wanted as much supply. SEFE then had to look to Taiwan and China where prices are lower and competition is no less intense. SEFE does have a deal to buy Forestry NSW native pulp logs. That has a few years to run but if Nippon decides to shut SEFE when that contract is up then sawmills and native harvesting in southern NSW will face the same problems as their Victorian counterparts. ‘‘Our strength is [that] our customer is our owner. But they can only support us so long. And they can buy cheaper, better quality chips somewhere else; if they don’t it drags their business down,’’ Mitchell says. While the falls in Victoria and NSW are large, nowhere has the collapse in the native timber industry been more dramatic than in Tasmania. At its height last decade the state was processing more than 5 million cubic metres of native timber. In 2012-13, as exports to Japan collapsed, a little under 800,000 cubic metres was processed. That plunged Forestry Tasmania to operating losses of almost $30 million a year. The bleeding has been stemmed courtesy of a government lifeline, but the future of the state’s industry is under another cloud. The newly elected Hodgman Liberal state government, supported by the Abbott federal government, is in the process of tearing up a peace deal stuck between environmentalists, unions and industry in 2012 to end the forest wars that have plagued the state since the 1970s. Plantation owners have faced their own issues. It is true hardwood estates have grabbed the vast majority of the Australian export woodchip market. But they are selling a classic commodity and are also facing the same international competition and pricing pressures as native timbers. Some plantations established under the MIS tax breaks, introduced under the Howard government, were put on marginal land with unrealistic expectations about what could be produced. Plantings have now come to a halt and some are even being ripped out of the ground and returned to traditional farming. In the 2013 financial year less than 2000 hectares of hardwood plantations were established. At the height of the MIS boom 76,000 hectares were planted in 2007 alone. The large softwood plantation estate has hardly moved in terms of area or volume for about 25 years. For pessimists wherever one looks forestry is not growing. Optimists, though, see signs of life in the woodchip market driven by emerging Chinese demand. The consultant Wood Resources International reports that Australian woodchip exports increased in 2013 after falling to a 12-year low the year before. That increase almost exclusively came from plantation. The first quarter of 2014 saw the largest shipment since 2010 at the same time as exports to China, for the first time, overtook exports to Japan. The rub, WRI also noted, is that Chinese customers paid almost $30 less per metric ton - or 15 per cent less - than Japanese customers. David Brand, chief executive of New Forests, runs a company which has snapped up 500,000 hectares of forests and land from the ruins of MIS ventures and Gunns. His firm forecasts that the volume of the Asian woodchip market will grow by up to 25 per cent in the next two to three years on the back of Chinese, and possibly Indian, demand. New Forests also expects the Australian hardwood plantation estate to contract by about 40 per cent, with owners, including New Forests, choosing not to replant some areas. Brand says that, ultimately, the company aims to produce the same amount of wood over a smaller area by increasing the yield of the plantations that remain. ‘‘Effectively for the world to become self-sustaining we’ve got to be able to increase productivity as opposed to try to clear more native ecosystem for production systems,’’ Brand says. What does that all mean for the future? Once the post-MIS rationalisation is complete, plantation owners might back themselves to claim an ongoing slice of growth in the Asian markets. But it is unlikely the woodchip exports markets will return to their former glory for the native harvesters. ‘‘For a resource like the mixed species [forests] in East Gippsland we can’t complete on price and quality against the blue gum plantations. And that’s the reality, and that’s one of the reasons why we are looking at alternatives,’’ Trushell says. Many in the industry are eyeing off technologies that may chew up large volumes of lower-grade wood and continue to support the harvesting of sawlogs. Jim Henneberry, who ran Australian Paper until February, points to bioenergy – where pulp is burnt in furnaces to produce energy – and other processes of feeding wood fibre into products such as biofuels, solvets, chemicals and others products as a possible transition point. He says these new technologies are not going to be dominant, but they can contribute to a much more profitable, sustainable industry. In that vein the industry is pushing for the burning of native timber for power to be included under Australia’s renewable energy target, which is under review. Others are hoping that by gaining certain sustainability certification – namely from the Forestry Stewardship Council that is favoured by green groups – they will again secure access to prime international customers, and at least lessen the social and environment conflict around their operations. Both Forestry Tasmania and VicForests are pursuing FSC accreditation to different degrees. In a sign that the threat to jobs is real the Construction, Forestry, Mining and Energy Union is becoming more vocal in its calls for government to support for the sector. For example it is pressuring the federal government to use Australian Paper products in government departments over imported paper. CFMEU national secretary Michael O'Connor draws a comparison to other struggling manufacturers. "The majority of jobs in the forest products industry are in the sawmills and in manufacturing plants. And it therefore faces the same challenges that other parts of manufacturing face, which is high Australia dollar, increased energy costs, increased competition from imports," he says. Judith Ajani, a senior fellow at the Australian National University's Fenner School of Environment and Society, says talk of transition for native timber is wishful thinking. A close watcher of the industry for many decades, Ajani says it cannot survive unless it can provide a cheap, high-quality and reliable supply for chips and sawlog products at a commodity scale. And she says it has proven unprofitable to do so. She says ultimately Australia’s timber industry will be virtually all plantation-grown, bigger and more productive than what has existed under the native-dominated model of past. Those who believe in the native industry argue it provides benefits from the social value of job creation in rural towns to the benefit of having timber companies as land managers that prevent fires and weeds infiltration. Another prominent argument is that plantation timber cannot replace so-called appearance products, essentially high-end, authentic furniture and hardwood floors made from native timber. Sinclair says he believes the future of the Australia industry will be focused around a handful of highly productive regions, both plantation and native, supplying a mix of high-value, manufactured products and underpinned by meeting smaller domestic needs such as timber for bridges and power poles and eventually the potential new markets of power and bio-products. To achieve this investor confidence needs to be restored and better use made of the existing resource. Ajani believes a bigger issue hanging over timber is resolving the social conflict between the environmentalists and industry. That means the transition to plantations. The role of government is critical, says Ajani. Governments own most of the native-log resource; they will decide if trees are burnt for power. She argues that with the growth in plantations and the fundamental market restructure, the forestry industry is already enduring, and Australia is more than 80 per cent on the way to a new model. It will fall to policymakers to decide whether the final step is taken. "It is the government’s role to end conflict in society. And it now has a practical way to do it," she says. "The question for government is, why would they keep it all going?" The inconvenient truth is out, logging forests increases bushfire severity according to recent research from Professor Lindenmeyer. This was demonstrated during the Black Saturday bushfires when previous logged drier forests were decimated by bushfire while intact moist forests in Melbourne's water catchments resisted burning. Yet the Napthine government continues to fund Vicforests, a sheltered workshop for environmental vandals who log them, while grossly overstating the paltry number of jobs in this destructive industry. It time this logging stopped and our Central Highlands forests were protected in a Great Forest National Park for future generations to appreciate. 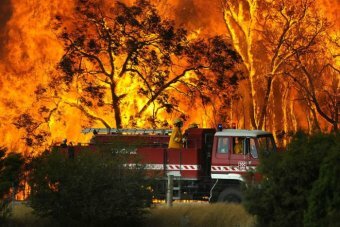 Logging practices can "greatly increase the severity of fires" in extreme weather conditions such as Black Saturday, Australian researchers have said. Researchers from the Australian National University (ANU) and Melbourne University examined hundreds of thousands of trees burnt in the 2009 bushfires in Victoria, which claimed the lives of 173 people on a day of extreme temperatures and high winds. They found that the increased fire risk began about seven years after an area had been logged and lasted for another 50 years. Professor David Lindenmayer, from the ANU, said the results showed the fires around Kinglake and Marysville were about 25 per cent more severe due to the clear-felling of forest in the area. "If we cut down a forest tomorrow, we're still going to be adding to the fire risk in 50 years time," he told 774 ABC Melbourne. Professor Lindenmayer said the big concern was that many of the areas recently logged were around towns such as Healesville, Toolangi, Warburton, Noojee and Marysville. "It's a really important outcome, and quite a concerning one, given how much logging has taken place in the last 40 years and how much logging is planned in the next five to 10 years," he said. Professor Lindenmayer said there should be no logging within five to 10 kilometres of towns to ensure "that we don't add extra risk through extra logging". "There's a need to comprehensively revise forest policy in this state to reduce fire risk," he said. "We need to let those forests recover and we need to develop the wet forests... which do have a fire suppressive effect." A study has found logging in the decades prior to Black Saturday made the deadly blaze much more ­extreme. THE heat and severity of Kinglake and Marysville fires that killed 159 people on Black Saturday was significantly increased by clear-fell logging of forests, scientists believe. In a landmark two-year study of the Kilmore East and Murrindindi Mill fires, which destroyed Marysville and ­severely damaged Kinglake, scientists from Melbourne University and the ANU examined satellite images of hundreds of thousands of trees burnt on Black Saturday. The scientists say the study showed conclusively that logging in the decades prior to Black Saturday made the deadly blaze much more ­extreme. They also warn that increased fire danger in forests lasts for up to 70 years after an area is logged, with the risk peaking between 10 and 50 years. 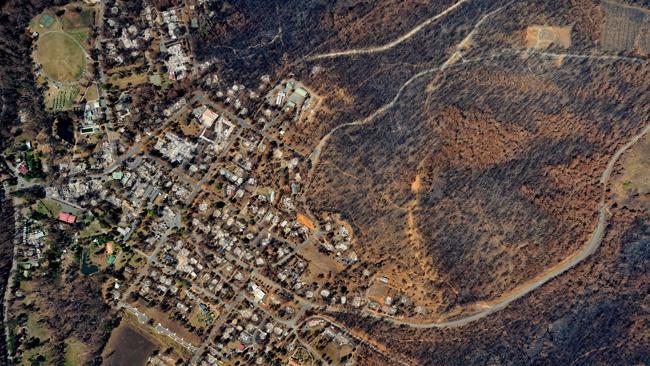 The findings of the study will have implications for the bushfire risk to towns such as Warburton and Healesville, which are close to logging operations. Professor David Lindenmayer, Australia’s leading scientist of forest ecology, who headed the study said it showed conclusively that clear fell logging increased the danger from bushfire. “Our findings show the severity of the fires on Black Saturday was significantly higher in the areas that had been logged,” he said. Professor Lindenmayer said preliminary estimates suggested the fire was 25 per cent more severe in forest that had been logged than in old-growth forest. “This added severity is sufficient to kill people and add significantly to property and forest damage,” he said. Prof Lindenmayer said the increased fire risk had strong implications for towns close to forestry operations such as Healesville, Powelltown, Warburton and Noojee as well as towns such as Woodend that were close to areas logged in earlier decades. “Industrial clear felling of ash forests should not take place close to any human settlement,” he said. The scientists believe the increased fire risk in logged areas is due to several factors. Regrowth forests have more trees packed more closely together and contain large amounts of flash fuels allowing fire to build in severity, the study found. Old-growth forests usually have wet rainforest under­storey canopies, which do not burn as well as the drier understorey canopies of regrowth forests. In the past 50 years, more than 47,000 ha of wet forest have been logged with 17,600 ha to be logged in the next five years. The Kilmore East and Murrindindi fires, which later merged, were the most deadly on Black Saturday, collectively killing 159 people , destroying 1780 homes and burning 168,542 ha.